Web folder mapping allows users to map web folder to the file system on local computer (WebDav). Users may see on a local computer and work with the same folders that they see in HTTP Commander interface with the same rights. In fact the work with files takes place online in a remote folder on server, so Internet access is necessary. All the changes made by a user apply to the files on server at the very same moment. Interface and work with files is more usual for users than web interface. The language set in local OS is used. Except main operations with files (creation, copy), a user may download and upload a plenty of folders/files using drag-n-drop function. Absence of such functions as zip/unzip, search, google docs viewer, etc. 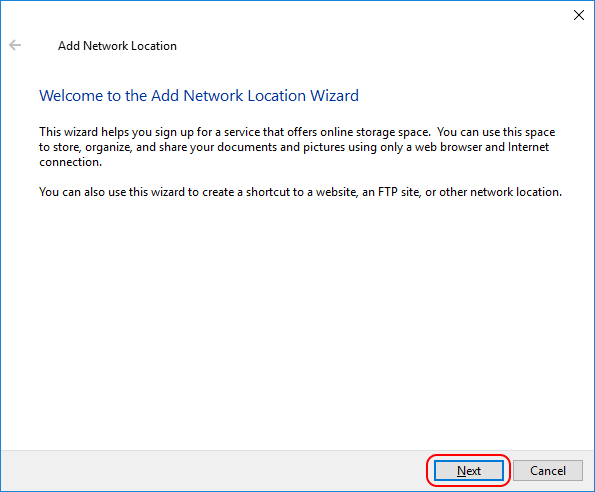 Turning off ASP.NET URL authorization on WebDav folder. Make sure the following section is present in application's Web.config file. Expand "Web Sites", "Default web site", "HTCOMNET". Right-click the "HTCOMNET" virtual folder and select "Switch to content view" in the context menu. In the list of files in middle panel select "hcwebdav" folder and click "Switch to features view" option. Now you may change settings pertaining to "hcwebdav" folder. Click "Authentication" feature on the central pane. Enable "Anonymous Authentication" and disable all other items. 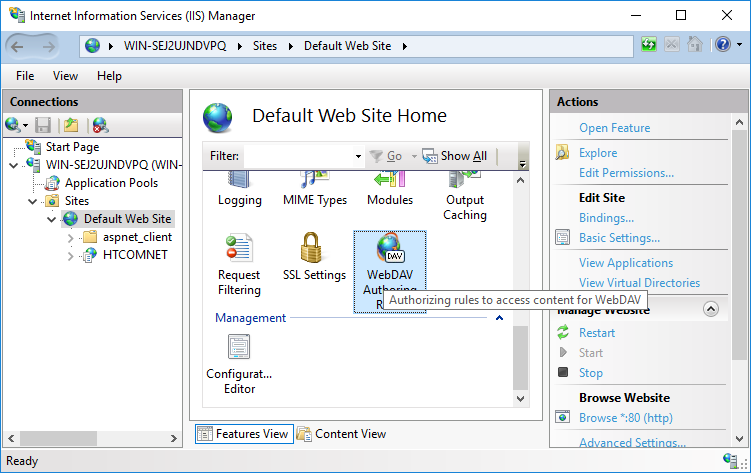 Internet Information Services (IIS) Manager → Expand "Sites" and then "Default web site"
In the right panel, find "WebDav Authorizing rules", open it and disable. It's OK if you cannot find the "WebDav Authorizing rules" feature. That means that built-it WebDav is not installed, you may skip this step. or download and run AspNetVerificationCompatibility.reg file. To allow '+' set the allowDoubleEscaping="true" in system.webServer/security/requestFiltering section of your Web.config file. To allow '&' and '%' set the requestPathInvalidCharacters="" in system.web/httpRuntime section of your Web.config file. To allow trailing dots ('..') set the relaxedUrlToFileSystemMapping="true" in system.web/httpRuntime section of your Web.config file. Note! Microsoft Windows Shell (Mini-Redirector) client does not support '%' in WebDAV item names. You cannot name your items like "Demo%Folder". A URL of a web folders looks like "http://www.yoursite.com/HTCOMNET/hcwebdav/" or "http://www.yoursite.com/HTCOMNET/hcwebdav/0/". "www.yoursite.com/HTCOMNET" should be replaced with real path. "hcwebdav" is an artificial path component serving to identify WebDav requests. This is not a real folder in the application root folder! Don't remove this component from URL! You may change this suffix with the IdentifierWebDav HTTP Commander setting (hidden by default). If for the AnonymousEditingOffice parameter indicated value of true, is mandatory presence of a suffix "0" — "0" path component classifies this WebDav URL as normal WebDav URL requiring authentication. 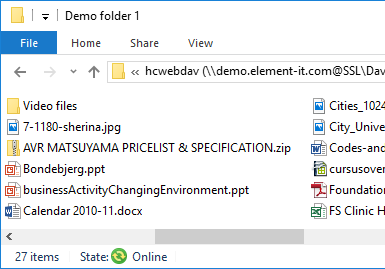 If you need to designate a specific folder, then append the folder path after /hcwebdav/ or /hcwebdav/0/ suffix, for example, "http://www.yoursite.com/HTCOMNET/hcwebdav/foldername" or "http://www.yoursite.com/HTCOMNET/hcwebdav/0/foldername". Anonymous WebDav URLs include "1" path component. For example, "http://www.yoursite.com/HTCOMNET/hcwebdav/1/7361fc3a/". These WebDav URLs resemble public links in that they do not require authentication. The fragment following "1" is a link key authorizing access to the file/folder. Note! By default, you cannot map web folders on server versions of Microsoft Windows Operating System like Windows Servers 2008, 2012, 2016 and 2019! By default, WebDav client is not installed on these OSs. See related FAQ question. 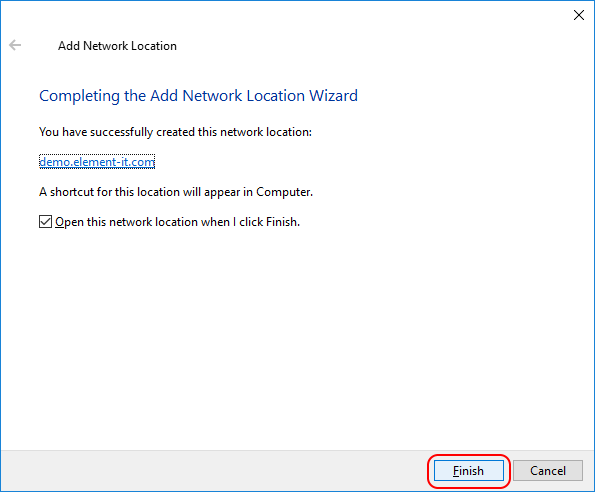 Open Windows Explorer, select This PC on the left pane, click Map network drive... on the context menu. In the new dialog open the "Connect to a Web site that you can use to store your documents and pictures" link at the bottom, click "Next" button twice. 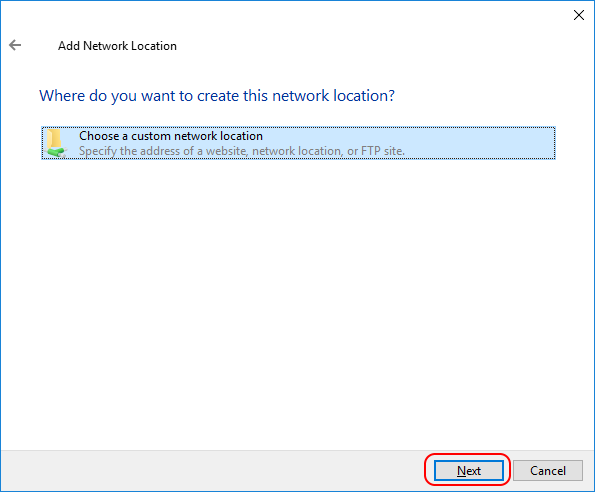 Insert the link of the web folder in the "Internet or network address" field, click "Next". 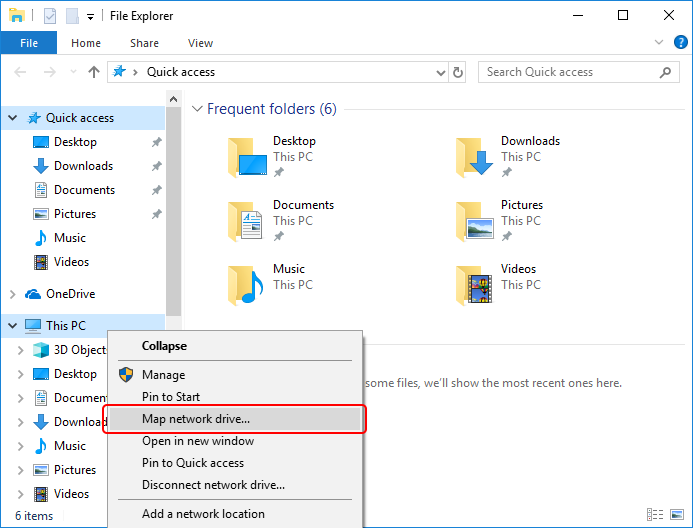 Open Windows Explorer, select This PC on the left panel, click Map network drive... on the context menu. 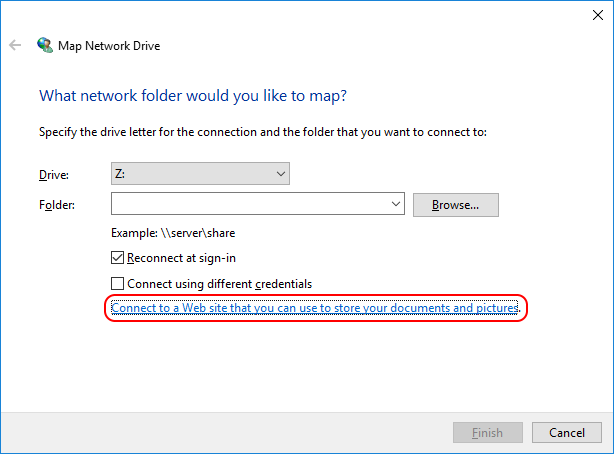 Map Network Drive dialog appears. 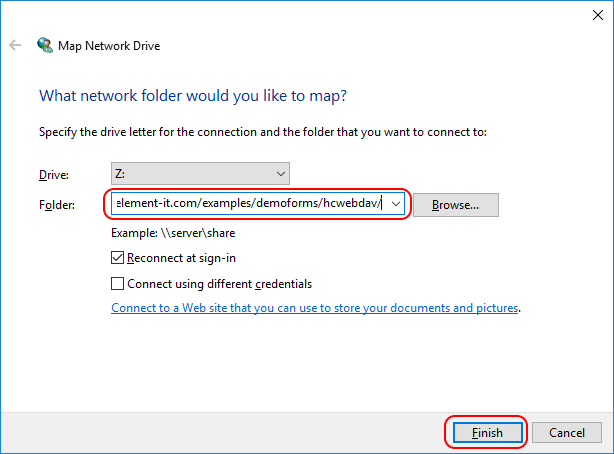 Select a drive letter in the drive drop-down list. Copy the link to the Folder field. Click Finish button. For MacOS: In the "Finder" menu, open Go → Connect to Server, insert the link of the web folder in the "Server address" field, click "Connect", in the new dialog select "Guest" or "Registered user" (for Windows authentication), click "Connect". For Ubuntu: Open Go → Location... 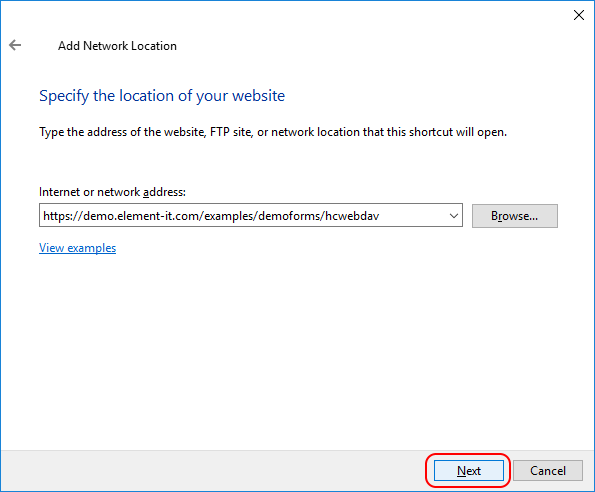 Copy the link of the web folder to the location field and repace "http://" with "dav://" or "https://" with "davs://". WebDav over http and https protocols. Windows WebDav client refuses to authenticate over http protocol when WebDav server uses basic authentication method. You have to use https protocol. WebDAV Mini Redirector WebDAV client of Windows refuse to authenticate over http protocol when WebDAV server uses basic authentication method. Authentication dialog shows, but client does not send credentials to the server, requests are not sent at all. In Windows Explorer asks for user credentials three times, then fails with an error message stating it is unable to access the folder. Windows Explorer does not ask for credentials, it displays an invalid folder error message a number of seconds after you clicked the Next button. 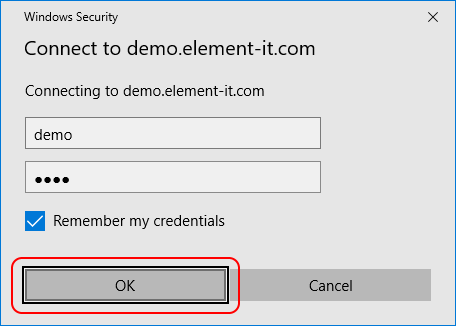 To enable authentication over http protocol, see Error message when you try to connect to a Windows SharePoint document library... > Workaround > configuring registry. registry value. Value type is DWORD. For changes to take effect, restart the WebClient service or reboot the machine. To configure https protocol, the web server should have a valid SSL certificate. You may install self-signed certificate to the server as described in How can I use HTTP Commander with SSL?, deploy custom certification authority in your corporate network, or obtain a certificate from one of the widely known authorities. Note that a self-signed certificate is untrusted by definition, unless you've installed it to the "Trusted Root Certification Authorities" store on each client PC. Connecting to WebDav server over https with invalid certificate is tricky business. Windows Explorer at first refuses to establish the connection at all, it keeps asking for user credentials eventually failing with confusing error message, stating that the web folder is invalid. The other time Windows Explorer connects to a web folder at one dash. We recommend you to obtain a real certificate from well known authority, or deploy Active Directory Certificate Services if all WebDav clients are bound to internal network. WebDAV on Windows 7 x64 operates slowly. Cause: the WebDAV client sends a lot of requests to the Web Server and introduces an artificial delay between requests. 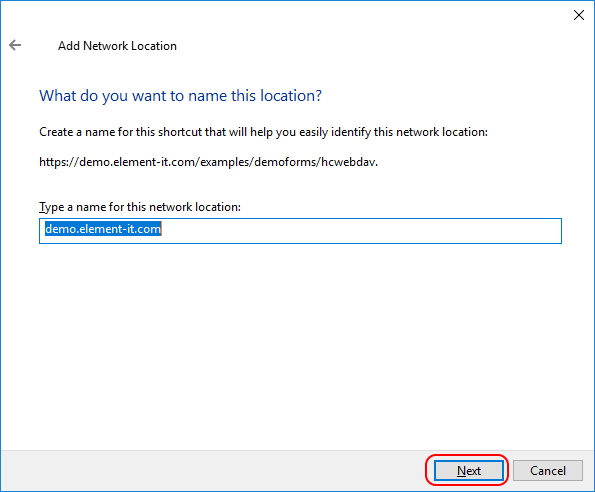 If you experience problems with mapping web folders on your server, try to map a folder on element-it demo server: https://demo.element-it.com/windows/hcwebdav/ (user: demo, password: demo). 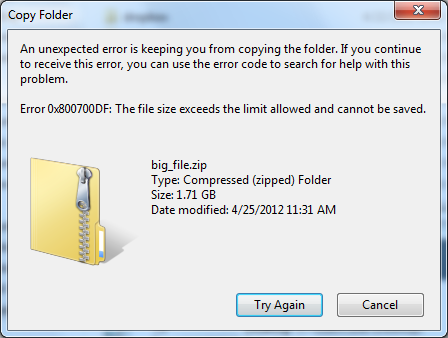 If you try to download a file that is larger than 50000000 bytes from a Web folder on a Windows OS, you might receive the following error message. For fix this problem add (or change) "FileSizeLimitInBytes"=dword:4294967295 (4Gb) key into registry on path HKEY_LOCAL_MACHINE\SYSTEM\CurrentControlSet\Services\WebClient\Parameters and restart OS (or WebClient service). For more info see KB900900. See also additional tuning properties in the register: WebDAV Redirector Registry Settings. "hcwebdav" folder serves the role of configuring anonymous access with IIS Manager. It is not required for correct functioning of WebDAV in HTTP Commander. On the contrary, IIS may interfere in processing WebDAV requests if this folder exists. We recommend to remove this folder after at the end of configuration.